There are a wide variety of mounts available for veteran Greek heroes to saddle up on. However, learning the is and outs of acquiring, upgrading and outfitting mounts can sometimes be confusing. Here we will attempt to clear up misconceptions and make it easier than ever for even relatively new players to pick up a sturdy mount! 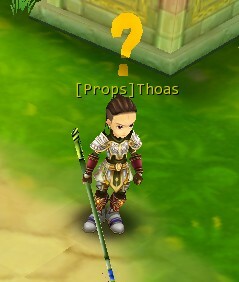 At Level 40, Athenians and Spartans can accept the "[Lv40]Knighthood 101 I" quest from either [Props]Thoas in Marathon (Athenian) or [Props]Aithra in Peloponnese (Spartan). After the quest is completed, a ridable Greek Steed will be acquired. While turning in the "[Lv40]Knighthood 101 I" quest, you will be able to start the "[Lv40]Knighthood 101 II" which will reward a [Book: Riding Skills]. When you've completed the quest, you can claim the [Book: Riding Skills]. Using the [Book: Riding Skills] (see the image at left below), allows players to master the Riding skill. Riding will be added to the skill list (see the image at right below) and can be dragged over to the action bar for quick use. 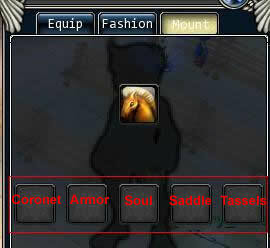 To ride the Greek Steed, it must be put in the mount slot (see the image at left below). Then, click the Riding skill to mount or dismount (see the image at right below). Each mount has 5 slots for equipping gear. This gear includes: Mount Coronet, Mount Armor, Mount Soul, Mount Saddle and Mount Tassels. Mount Coronet: Increases the rider's hit rating. Mount Armor: Increases the rider's max health. Mount Soul: Enables the rider to absorb more damage. Mount Saddle: Increases the rider's max health. Mount Tassels: Increases the rider's dodge rating. Tip: Players can create equipment for mounts by utilizing the profession system. Mounts can only be equipped with items of the same level or lower. Likewise, players can only ride mounts that are the same level or lower than they are. Also keep in mind that a mount placed in a mount slot with equipped gear must be of the same level or higher than the gear it will be equipped with. To remove a mount from the mount slot, you must unequip the items equipped on the mount. However, if you wish to place another mount in the mount slot, you only need unequip the equipped items which are higher level than the mount. Once enough Soul Stones have been acquired, visit the Mount Feeder in the main city (120, -170) and upgrade the mount, increasing its movement speed. The amount and level of the required Soul Stones for upgrading a mount are equal to the target level of the upgrade. For example, to upgrade a Level 40 mount to Level 50, 50 Soul Stones (Level 50) are required. Likewise, 120 Soul Stones (Level 120) are required for upgrading a Level 110 mount to Level 120. Tip: Players can create Soul Stones by utilizing the profession system. Click here to see the different appearances of mounts at different levels. When exchanging a mount for a mount shifter, there are several things to consider. 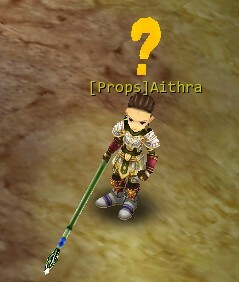 First, a mount must be Level 40 for an exchange to work. If a mount is above this level limit it must be downgraded before being exchanged. To downgrade a mount, seek help from the Mount Feeder in the main city. See the image below for more details. To exchange a mount for a mount shifter, follow the steps below. 1. Go to the vicinity of the [Mount Feeder] in the main city. The Mount Feeder is beside the Master Vestment Forger. Move towards the Master Vestment Forger using the autotrack functionality to find the Mount Feeder. 2. Talk with the Mount Feeder and click the related options as illustrated in the image below. To change the appearance of a mount, follow the steps below.